While emptying the pockets of my barn coat before its regular trip through the wash recently, I thought about what an odd anthropological study its contents would make. Between all the lint and straw, dirt and crushed bits of eggshell (whoops), what does all this junk say about, well, its owner? There won’t be any study funded, surely; no penniless grad student shall pick through its contents; and unless Etna were to magically appear nearby, blow its stack and bury me in ash on my way to the goatshed with pockets still full, no future somebody is bound to wonder either. Its contents: Tiny box of strike-anywhere matches. Box cutter. Pliers. Right garden glove (left missing). Various bits of wire, T50 staples, small measuring tape, safety glasses. About 5 types of screws, a few rusted nails, a large permanent marker, a few pellets for the pellet gun. The aforementioned dirt and junk. A penny. A snack-sized plastic bag. A twist tie. Now, I wash this coat with extreme regularity. You would too, I would hope: owning such a cover-up is fairly sensible thing to do if one is often called to pick up something muddy, poopy or bloody. It is a knockoff of a Carhartt canvas coat, with a zipper, probably three times larger than it needs to be, cloth lined, and it sports a few holes. And EVERY time I wash it, I find practically the same things burdening its pockets. What an odd life this coat has. It never leaves the property, unless it accompanies me on trips to the butcher (poultry often are muddy, poopy AND bloody, poor things). But it is part of my uniform. Interestingly, I never leave the property in the uniform, either. So it’s a secret uniform, wherein I transform from mild-mannered white collar El to Super Farmer El. Not that I don’t think I look fabulous in such dowdy he-man-wear; I do. I find it helps to have a bit of an attitude, especially when one is prone to slip in chicken poo, fly dramatically through the air, and land firmly on one’s rear end. May as well dress the part of a superhero. El – I have one just like it. Well, not JUST like it, mine is insulated flannel but none the less…If I happen to run to the post office wearing mine, anyone I encounter is alerted by it that I haven’t much time for chit chat. 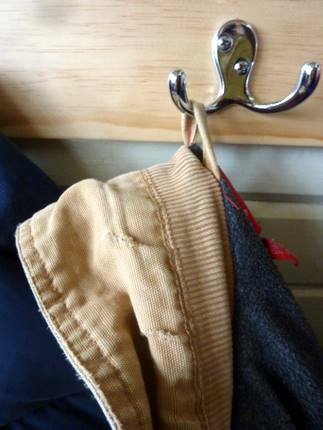 Mine are tattered hoodies, the pockets filled with a similar mishmash of objects. It’s good to see you here again. Hm, one may need to invest in such an attire. Even though I do not delve [yet] into animal husbandry – I am usually covered in dirt/leave/what have you, and I am prone to falling on my arse. Normally I wear a pear of torn jeans, t-shirt with a hoddie on top, a straw hat [because I’m awesome], and a pair of rain boots. No apron, nothing in the pockets… and forever am I searching for the things I put down. I, too, have a Serendipity Farm coat…it’s pockets contain small ziplock bags of various unlabelled seeds that I collect on my walks with the dogs, plastic tie grips, bits of smooth glass and pebbles (beach walks), flower heads and leaves of something “interesting” I want to research when I get home, and anything else that interests me on my walks. As a horticulturalist my treasures run to the seedy and the weedy. It would make a very interesting thesis to be going through someone elses pockets in an effort to find out what they mean about the person. Who knows…you might just have given some poor addled brain an interesting way to ensure they are able to continue on studying this year ;). I look absolutely fabulous in my univorm. A lot better than I look in my corporate uniform, I’m pretty sure about that. And I do wear it out of here if I’m going to the agway. And I look REALLY goofy driving up in that BMW x3 my husband left behind. The one I turned into a farm truck but also drive to work. 🙂 Sometimes there has been chicken poop on the hood. I have the a “same” jacket. His name is “Sherpa”. He does a lot of heavy lifting for me and yes…he doesn’t come to the office with me. Sent you an email. Need help. Did you see the email? Thanks! My barn coat usually has a rip or two showing from catching on a nail or a goat nibbling at me. Always look my best ?? But, I want to know why is it during these times a neighbor or someone looking for directions stops by…and sees me at my best. Oh well..what you see..is who I am.. Gotta’ love country life..! !